Well, someone got a good buy today. I'm sure of it. All they had to do was walk on over to MBK,* take a look at the phone counters and find my phone sitting there. I am certain that, if not at MBK, then my phone is somewhere on the black market being hawked for a very quick sale. Out for a stroll with my kids, I strapped on the Ergo backpack and casually placed my mobile phone in an exterior pocket. "Gasp," you exclaim. "Not the exterior pocket." Distracted by piles of bananas and pens and salted pomellos for sale, I casually said my hellos to the vendors. I bent over to get a look at the pet pigs from my children's eye view. I stopped to dig for some baht to throw into a nearby fountain. I.... wait... are those dozens of roses I see on the back of that parked motorbike? Some of the most beautifully fragrant roses I've ever seen sat perched in a little milk crate, wrapped by the five dozen in bundles. Approaching slowly, I asked the price. 80 baht! (That's about two and a quarter in the States.) 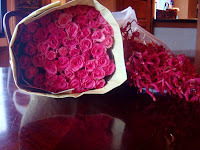 I took one bundle (five dozen) vibrant pink roses and threw in a big bunch of leggy garnet orchids as well. With a child holding each hand, a back pack stuffed with bananas falling off my shoulders and flowers shoved under my arms, I was quite the unsuspecting victim. Stopping at the coffee shop (Do you have any idea how heavy five dozen roses with all of their stems and leaves still attached are? ), I had to ring my husband to brag about the steal I got on my flowers! With the pocket flap opened and no phone in site, it looks like my flowers actually cost a bit more than 80 baht. *MBK is billed as an indoor version of Thailand's famous outdoor street markets. Everything is price negotiable and the electronics zone is known for buying and selling used merchandise (acquired legally, I'm sure). Rose syrup is used in a popular drink in Malaysia. This is inspired by that drink and is a beautiful twist on the traditional martini. Plus, it looks stunning served as a pre-dinner drink at a small supper party. Remove the petals from the roses, reserve a few petals for garnish) and place in a large heatproof glass container. Pour the boiling water over the top of the petals and cover tightly. Allow to sit for one hour and strain, reserving liquid. In a saucepan, reheat the rosewater and add the sugar. Without stirring, bring to a boil and then lower the heat to a simmer. Watch closely, but allow to cook until the sugar has completely dissolved (about 5 minutes). Set aside and cool. In a shaker add ice, 2 ounces of vodka, and 1 ounce of the cooled rose syrup. Shake, pour into a martini glass, garnish with a single floating rose petal and serve immediately. **Can be found as an edible flower in gourmet groceries or purchased dried from a variety of online sources. Or, use your own garden roses. You want something that is pesticide-free. If you can't find the appropriate roses, purchase a pre-made rose syrup or rosewater from your grocer. Ai, pity about the phone! But the roses sure are beautiful! Oh, that's just terrible! It probably is somewhere inside MBK...lost forever. Good thing you were able to fix up a nice martini after such a day. That is a bummer about your phone! The flowers are so so so beautiful!! I'm enjoying reading your blog. Looking forward to hearing your comment! Who else is Loving Rice? Imagine you're camping out in a penthouse with just a few belongings... beautiful, comfortable environment, but everyday basic chores are a lot of work without adequate supplies. It's sticky and humid outside, the kids are hyper and the parents are tired. Everyone is in personal awe that we are doing it... we've arrived and are living out our plan of the last year to set up house in Bangkok, Thailand. Adventure awaits around every corner and, while your mind can hardly wait to get out and explore, your body prefers the comfort of a cushy chair or the cool, blue swimming pool. But, survival instinct kicks in and you decide you're absolutely sick of eating plain steamed rice. Time to begin "Loving Rice" and seek out what you need: some communication to home, some varied food choices, a fantastic rice paddle and the ability to kick the jet lag to the dusty Bangkok curb! 2008-2011 copyright. All text and photos are the work of Shelby Reynolds, unless otherwise noted.